I previously reviewed the first Nicola Connolly novel which you can read here, so I was looking forward to seeing what happened next. When we meet Nicola, she has moved to Falmouth leaving all her troubles in Bath behind. Or so she thought. DI Tom Hudson has also moved to Falmouth to start a nice quiet job there after the drama of the investigation in Bath. Neither knows about the others presence. Until they literally bump into each other. After Bath, Nicola is planning a quieter life in Falmouth. She still needs to kill, of course, that isn’t going to change. Finding a measure of contentment in the stunning penthouse apartment she has rented, she figures out a way to stay in it, radically changing herself in the process. It involves killing someone, and getting married. But neither is a problem for Nicola. Everything falls into place for her until she bumps into Tom Hudson, newly promoted to detective inspector and now working in Falmouth. Nicola doesn’t want to become involved with the police again, Tom, still reeling from the events in Bath, doesn’t want her to either. But when a woman goes missing, and Tom is convinced she isn’t the first, he has no choice but to ask for Nicola’s help. Can they work together to solve yet another case? Tom begins the investigation into the missing woman, and raises concerns when the pattern matches previous missing persons and wonders if there’s a killer at work. As the investigation starts moving, Tom remembers how Nicola was able to help in Bath and wonders if she could do the same here. Nicola is still a killer, but, due to circumstances, isn’t working in a care home anymore so has to go to great her lengths to follow her needs. When Tom comes to her to ask for her help, does she really want to invite the psychic connection back so it can haunt her dreams again? And risk being uncovered? I won’t go into more detail as I can’t without spoiling something! Sufficed to say the story really picks up (I stayed up reading this to the end last night so I could see what happened!!!) from here and when the end comes, you will not believe it! I was very surprised! Normally I can guess as to who the perpetrator is, but not with this one! I was genuinely incredulous toward the end of the book! 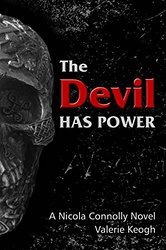 I enjoyed The Devil Has Power a bit more than Deadly Sleep if I’m honest. There was more background and it made it easier to follow! I gave this 3 stars on Goodreads. Thanks again to Valerie Keogh!